Building on biographies by Richard Brookhiser and Willard Sterne Randall, Ron Chernows Alexander Hamilton provides what may be the most comprehensive modern examination of the often overlooked Founding Father. From the start, Chernow argues that Hamiltons premature death at age 49 left his record to be reinterpreted and even re-written by his more long-lived enemies, among them: Thomas Jefferson, John Adams, and James Monroe. Hamiltons achievements as first Secretary of the Treasury, co-author of The Federalist Papers, and member of the Constitutional Convention were clouded after his death by strident claims that he was an arrogant, self-serving monarchist. 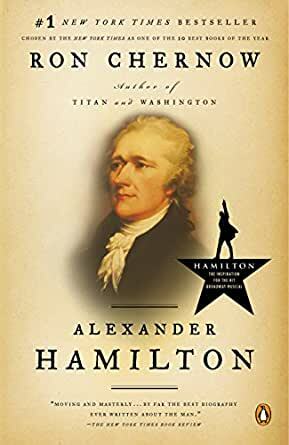 Chernow delves into the almost 22,000 pages of letters, manuscripts, and articles that make up Hamiltons legacy to reveal a man with a sophisticated intellect, a romantic spirit, and a late-blooming religiosity. One fault of the book, is that Chernow is so convinced of Hamiltons excellence that his narrative sometimes becomes hagiographic. Nowhere is this more apparent than in Chernows account of the infamous duel between Hamilton and Aaron Burr in 1804. He describes Hamiltons final hours as pious, while Burr, Jefferson, and Adams achieve an almost cartoonish villainy at the news of Hamiltons passing. After hulking works on J.P. Morgan, the Warburgs and John D. Rockefeller, what other grandee of American finance was left for Chernow's overflowing pen than the one who puts the others in the shade? Alexander Hamilton (17551804) created public finance in the United States. In fact, it's arguable that without Hamilton's political and financial strategic brilliance, the United States might not have survived beyond its early years. 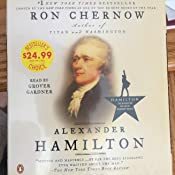 Chernow's achievement is to give us a biography commensurate with Hamilton's character, as well as the full, complex context of his unflaggingly active life. Possessing the most powerful (though not the most profound) intelligence of his gifted contemporaries, Hamilton rose from Caribbean bastardy through military service in Washington's circle to historic importance at an early age and then, in a new era of partisan politics, gradually lost his political bearings. 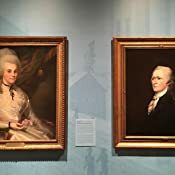 Chernow makes fresh contributions to Hamiltoniana: no one has discovered so much about Hamilton's illegitimate origins and harrowed youth; few have been so taken by Hamilton's long-suffering, loving wife, Eliza. Yet it's hard not to cringe at some of Hamilton's hotheaded words and behavior, especially sacrificing the well-being of his family on the altar of misplaced honor. This is a fine work that captures Hamilton's life with judiciousness and verve. Illus. This book is a beautifully rendered portrait of Hamilton, both his public life and his private life. As so many other reviewers have noted, the book is an example of first-rate biographical research and most of the book is well-written. Up to chapter 16, “Dr. Pangloss,” the story is superbly told. But, when Thomas Jefferson enters Hamilton’s life, much of the book becomes a contrast between Hamilton, who had his own well-documented personal failings, with Jefferson who, if the text is to be believed, had nothing but personal failings. Jefferson is variously described as hypocritical, duplicitous and conniving. Undoubtedly, Jefferson fit much of this description but so did Hamilton in their Federalist-Republican (anti-Federalist) feud in the 1790’s. What bothered me was the unrelenting negative portrayal of Jefferson, Madison (after 1790) and John Adams. Hamilton is portrayed accurately and fully as a brilliant and decent man with some major flaws. Jefferson and, to a somewhat lesser extent, Madison and Adams, are portrayed as deeply flawed individuals who happened to have a few good points. The language reinforces this. If one were to count the negatively loaded adjectives and verbs accorded to Hamilton’s three main opponents, they would vastly outnumber any positive linguistic connotations. In order to sharpen Hamilton’s character portrayal, the image that Chernow gives of Hamilton’s opponents is, given other biographies of these men, less than just. The name-calling, smear campaigns and character assassinations in the 1790’s are appalling (but less so given the 2016 Presidential campaign). However, a dozen years after independence and only a few years after the Constitution was ratified, the fears of the anti-Federalists were real ones. Jefferson’s and Madison’s hypocrisy and the foibles of John Adam’s personality notwithstanding, the concerns expressed were often genuine ones at that time about what kind of country the United States would be and how the Constitution should be interpreted. The possibility that the Jeffersonians may have had a point gets lost in Chernow’s constant barrage of claims about duplicity, hypocrisy and malevolent intentions. So I thought this was a brilliant portrayal of the man who founded our economic and, to a large extent, our political system. The portrayal of Aaron Burr is excellent and the factors leading up to the duel are gripping. 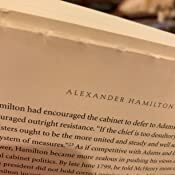 But the mid-section of the book would have been even stronger if Chernow had presented Hamilton’s foes in a fuller, less negatively charged light. All the hype that you have heard about this book is true. It is an outstanding biography. I admit I was somewhat skeptical. 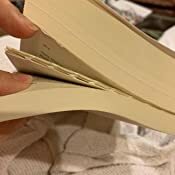 When I saw how much this book was dominating every single best-seller list, I figured the reason might be because of the highly successful musical (which I have not seen, nor plan to see). After completing the book, I can’t help but feel the reverse is true – someone, somewhere found a great biography about a great man, and then decided to make it into a musical. I read an awful lot of biographies. My tendency is to favor Americans in the years around the time The United States came into existence. With rare exceptions, I would have to say that I thoroughly enjoy all of them. So why should this one be any different? Is it really that different than all of the other biographies out there? I even recently read a biography about George Washington (who was close to Alexander Hamilton) by the same author (Ron Chernow), and even that one wasn’t particularly sensational. For whatever reason, though, this one is truly exceptional. Like all well researched biographies that are about 800 pages in length, this one is very thorough. It doesn’t exclusively focus on one aspect of his career, nor heavily focus on any particular area of his life. Everything is included. From being orphaned in the Caribbean at a young age to being killed by the Vice-President of the United States in a duel. Everything is here. Although there’s a lot of material to cover, Chernow works magic when transcribing the man’s life. I rarely ever got bored. The book seemed exciting, as though someone were telling me a fascinating story as opposed to simply recounting a famous person’s life. Quite often when writing such a detailed exposition, ennui often creeps in from time to time. An everyday life of a politician doesn’t necessarily relate to captivating reading. Fortunately in this case, instances of boredom are rare. There was one time when I mentally dozed off for a few pages while the author explained in a tad too much detail how Hamilton’s central bank worked, but these instances were quite infrequent. I felt like I intimately knew so many of the many people who interacted, good and bad, with Alexander Hamilton. I truly wished that I could have traveled back in time to meet all of these fascinating people. There are a lot of people that didn’t like this man, nor did he care for them. Particularly interesting is how the author treats Thomas Jefferson. Had this been the only book you had ever read, you would come away with the notion that Jefferson was Satan incarnate. Equally unfavorable treatment goes to John Adams, James Madison and James Monroe (all early U.S. Presidents, coincidentally). I would recommend further reading on these individuals for a more balanced perspective. In fact, had it not been for George Washington, you could argue that there wasn’t anyone around at the time of any importance that thought highly of Hamilton. Of course, having George Washington on your side counteracts a lot of adversaries. The author is quite biased in favor of his subject matter. Oh sure, he points out many mistakes and deficiencies of Hamilton, but you end up firmly in the man’s corner, despite the squabbling with so many of the other founding fathers. The biggest source of discontent is Hamilton’s Federalism as opposed to Jefferson’s Republicanism. The birth of our two-political party system. Both ideologies have highlights. To truly understand the significance, one must truly imagine life directly after America’s independence is won. Now that we’ve won, what do we do? We still need a centralized government to rule. Right? At the time, many didn’t think so. Such questions are easy to answer in hindsight. Hindsight does tell us, that Hamilton was right about a lot of things during our country’s infancy. I implore you to read this if you’re a fan of history. If you’re not a fan of history, I implore you to read it as well – just make sure you consult other sources so you come away with a strong, balanced perspective. 4.0 out of 5 starsScandals and Insults among our Founding Fathers that could be ripped from Today's Political Headlines ! I read a good deal of history - some historians are better writers than others. EX: I enjoy McCullough more than Kearns-Goodwin. So I like to learn about the great leaders and events of our past, but it is tricky to find both a compelling story and compelling storyteller. This book has gotten a lot of attention because of Miranda's revolutionary (play on words?) play. 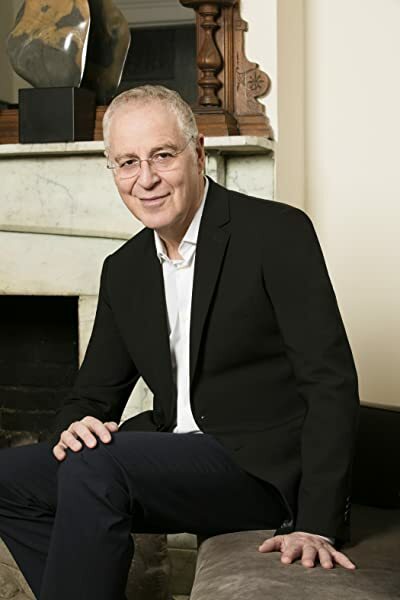 Chernow's book is not flawed, but it is exhaustive. In short his book is an amazing story - the players, the insights, the events....frankly it is all quite mesmerizing. There is a lot here that we know, there is a lot we think we know, and there is so much more that we (at least I) never dreamed: The treachery, the mobs, the scandals and the foibles of the great men who created our great Nation. And almost any line in the book (well except the parts about productivity) could be ripped from today's headlines. Great reading - & then go visit Alexander & Eliza at the Museum of the City of New York!